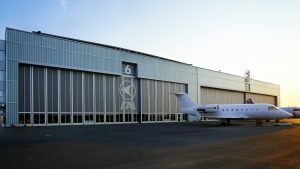 Customised Aircraft Hangar Door Solutions. New approaches in technology and material have marked the success of Butzbach door systems for more than 30 years. Customer specific door solutions, forward-looking technologies and a unique consulting and support system are Butzbach’s strengths. 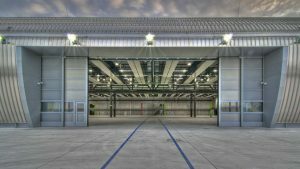 Butzbach is one of the leadings firms on that market due to its long-time experience in the development, construction, production and installation of industrial doors and hangar doors. Butzbach stands for customised door solutions in excellent quality for any customers’ needs. The combination of different Butzbach products allows integral solutions that meet the customers’ requirements in terms of visual appearance and functionality. The continuous establishment of subsidiary companies and the excellent co-operation with sales partners guarantee an optimum support in technical consulting, installation and service. Made in Germany – for decades the name Butzbach has stood for quality, customized solutions and reliability Made in Germany. Our clear commitment to the production location in Germany and the therewith associated values mutually stand for the highest quality standards and the satisfaction level of our staff and customers which are the focus of our company’s philosophy. Our first class reputation in regards to quality and reliability is above all a result of the expertise of our highly qualified staff – we guarantee a quick reaction to our customer’s needs and a continual high level of quality due to our in-house production depth of over 80 percent. 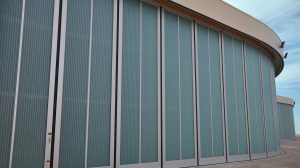 The combination of tradition and innovation, in connection with the strict orientation on our customer’s needs, are the basis of our progress towards being an internationally successful specialist for door and façade systems. 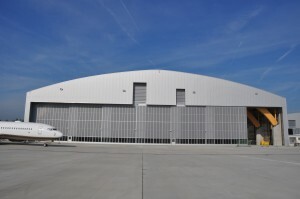 When speaking about doors with extraordinary design and manufactured for all kind of installation situations, then Butzbach customised hangar doors are not only first choice for owners of business aircrafts, but also for international airports, aircraft manufacturers, maintenance firms and military installations. 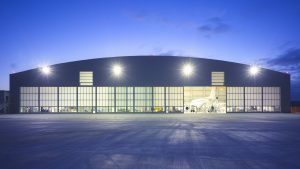 Butzbach offers an extensive range of high quality sliding door systems for aircraft hangars up to a width of 300 m and a height of 45 m. More than 650 installed hangar door systems worldwide speak for themselves. Butzbach customised hangar doors do fulfil top-notch requirements in regards to functionality and reliability – and thereby it makes no difference if the installation is an oversized hangar door for the superjumbo Airbus A380 or a comparably small door to accommodate business aircrafts. Butzbach provides not only door installations, but also complete systems (including bottom track and the top guide rail) and secures the long-term function of the door system due to the extensive know-how. 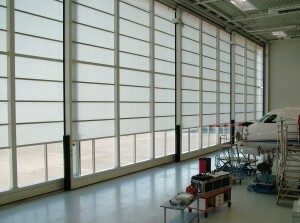 The fibreglass panelling is manufactured by Butzbach in a self-developed technique with a translucence of 78%, whereby the harmful UV-radiation is completely absorbed. 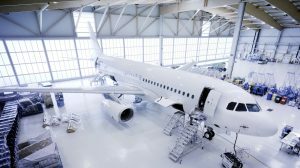 Thus bright and light-flooded working environments are created, reducing daytime lighting expenses even with closed doors, and subsequently the employees have a pleasant working atmosphere in the hangar. The different fibreglass colours “Brilliant”, “Sapphire-Blue” and “Emerald-Green” along with the option of incorporating images into the material, enable extensive design variants. 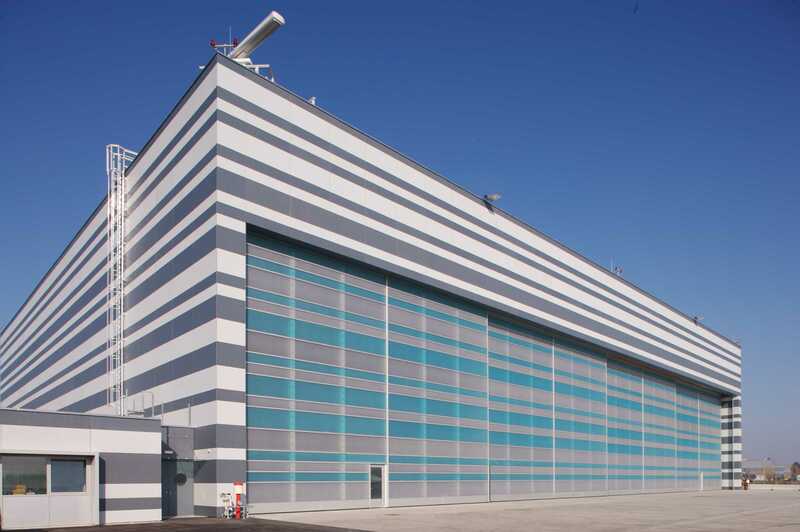 The special twin-walled design of the fibreglass elements provides excellent thermal insulation and allows the passive use of solar energy – in combination with the very good sealing of the door system, a considerable reduction of heating expenditure can be achieved in the production hall. Other door fillings like sandwich panels or trapezoidal sheet metal can be realised according to customer specifications. Uncounted designs are accommodated by varnishing the fibreglass panels in combination with colour-coated profiles and by offering vision panel options, which extend the design capacity even further. 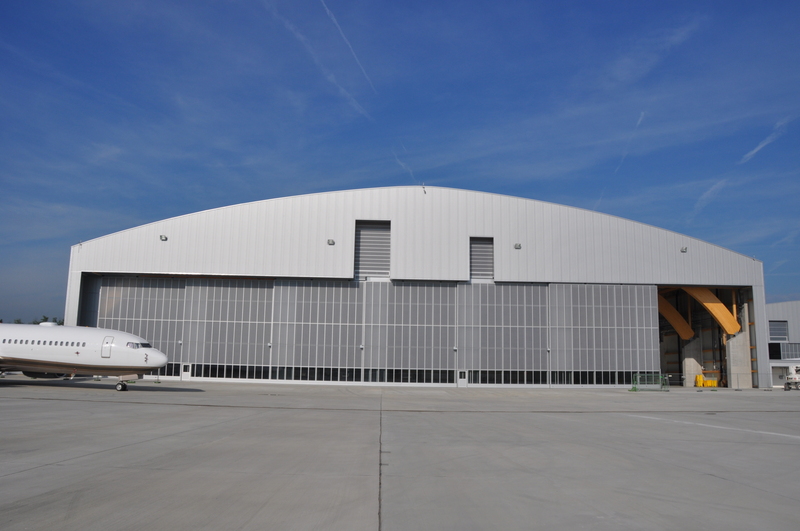 Each hangar door is (as usual for Butzbach doors) manufactured exactly according to customers’ specifications. The doors can therefore be provided in nearly all dimensions and are suitable not only for new constructions, but are also excellent when utilised in renovation tasks, where the options are often very limited due to the constructive circumstances and the statics necessities. 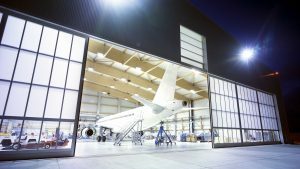 According to customers’ needs, Butzbach manufactures individual and customised hangar door solutions with freely moveable door leaves, telescopic sliding doors or around the corner doors. Extra technical equipment, such as tail doors and integrated pass doors without threshold and other doors, can be accommodated with ease. 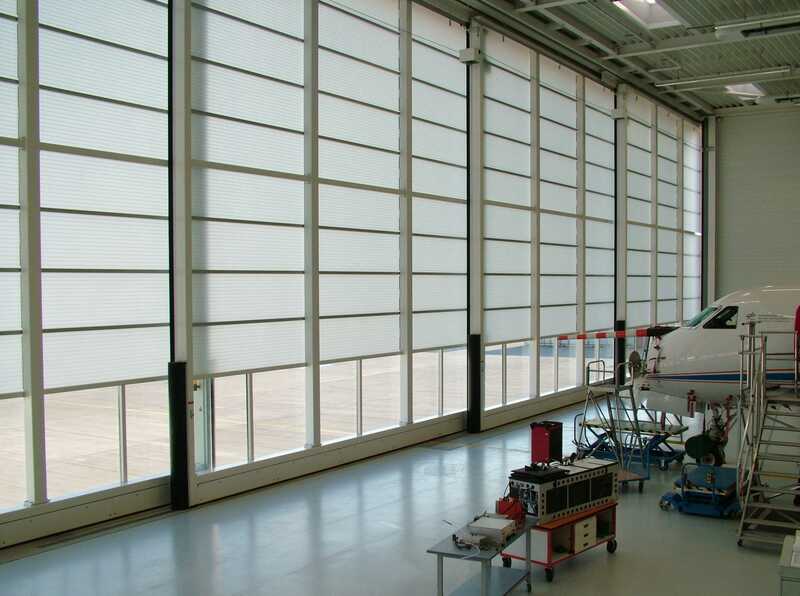 Butzbach hangar doors operate extremely smoothly – even marginal engine power is sufficient to operate the door and in case of power failure, unproblematic manual opening and closing is possible even with large dimensions. Flexible opening widths from one metre to the complete width of the door system are possible due to the easy operation of the door leaves. Most of the major Airlines, Airports, Military and Airforce bases can be counted amongst Butzbach’s clients list. 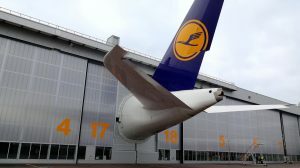 A few years ago Butzbach installed a hangar door at the German Airbus premises in Hamburg-Finkenwerder. 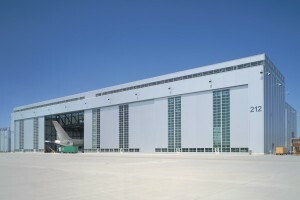 The customised hangar door is 190 m wide and 27 m high. It consists of three door leaves, the main leaf itself being 100 metres wide. Two Airbus A 380s can be parked behind this door side by side. Many years of experience and close cooperation of designers, engineers and fitters enable Butzbach to realise even most complicate building projects on schedule. Butzbach service starts with the first contact. No matter if you address one of the technical specialists on site or a member of the project team at Butzbach premises – the intensive and constructive dialogue with the customers is always the main focus of attention. The entire Butzbach team is expertly trained and has gained experience for many years. Worldwide Butzbach guarantees a global, quick and extensive service structure, because of its international sales partners. Due to the long-term cooperation, regular intensive training and professional development, these international partners are familiar with all products and therefore secure the high-quality supervision of your Butzbach door systems.